Some residents of barangay Comon in Aritao, Nueva Vizcaya believe that they've received something that is akin to a sign from God. An image has appeared in the trunk of a banana tree there. The image, the residents say, possesses a striking resemblance to Jesus Christ. People has since been flocking to the banana patch to look at the image. 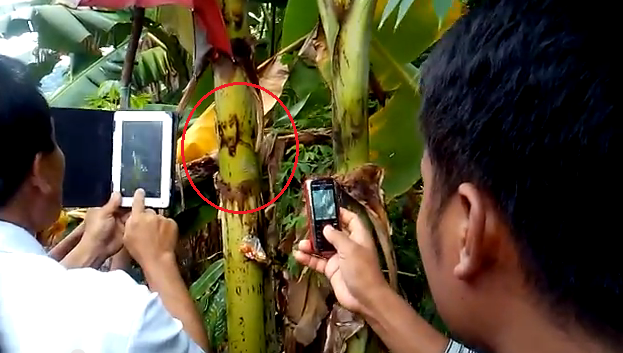 The image first gained attention when a youthful resident named Nathaniel A. Cordero took a photo of it and posted it on Facebook with a caption that says, "I just captured an image of papa Jesus on a banana tree. Grabe kinilabutan ako dito. "The photo quickly piqued the interest of a lot of people. A few days later, Cordero posted an update. This time, it's a video showing the image with water seemingly flowing like tears from its eyes. Part of Cordero's caption for the video goes, "Please share this video if you believe in God." From there, the image went viral as hundreds of people shared the video. Some people shared the video with hashtags such as #keepthefaith, #miracle and #amen. That's when people started flocking to where the banana tree is located. In another video update by Cordero, several people can be seen taking pictures of the image with their tablets and cellphones. Others approached and touched the image, probably hoping for something divine to flow back to them. There is this thing called pareidolia. This is a psychological phenomenon wherein a person perceives some random image or sound as something significant. When you look at the clouds and and you see an image of a rabbit. When you look at the water stains in your bathroom floor and see the image of a cat. When you look at the veins of a dead leaf and see an image of a bearded face. These are instances of pareidolia. This phenomenon can be used to explain what Cordero and the residents of Aritao have seen in the banana tree. 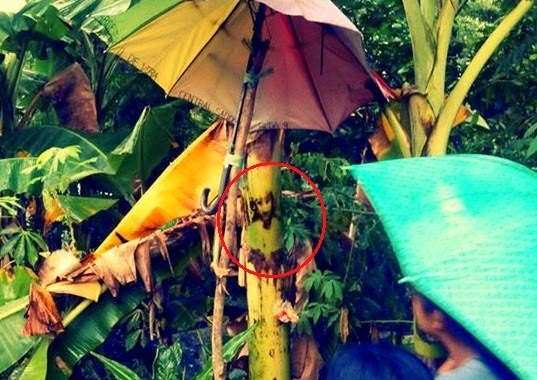 To state the obvious, the image on the banana tree can resemble anyone who has a beard. Charles Darwin, Charles Manson, Rasputin, Aragorn, Jon Snow, etc. Why do people always quickly go with Jesus Christ or God? If I am to take a photo of the same image and proclaim that it resembles Charles Darwin, people will probably laugh or mock me. Some will say I'm stupid. The point here is that if it's Jesus Christ, the image is a miracle. If it's somebody else, the claimant is tagged a moron. And then there's the question that a lot of religious people ignore. This question is "Why?" Why would Jesus go around putting his likeness in the trunks of banana plants, in toasted bread, in water stains, etc.? Why confuse your believers with such cheap tricks? Why not just show an exact image of yourself to erase any doubts? Plaster yourself on the wall - head, feet, everything - and people will believe. Seeing a random image in a banana plant that slightly resembles a bearded guy, claiming it to be the likeness of Jesus, and taking it as a sign that he is real is wishful thinking. It's illogical.